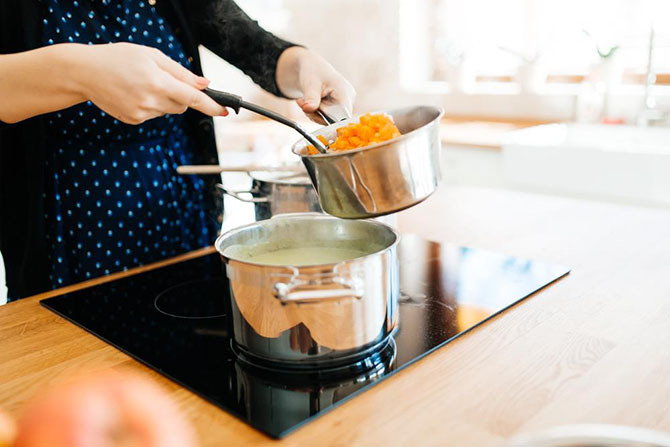 Induction cooking is one of the fastest and most efficient ways of cooking on a stovetop, as it produces heat directly in the cookware, rather than using a source of heat to heat up a pan or a pot, resulting in a much faster increase in temperature. It is also one of the safest ways of cooking, as there’s no fire or gas involved and, unlike electric stoves, induction stoves tend to stay cool to the touch (except the area under the cookware) and cool down really-fast. Because of these advantages and more, portable induction cooktops are becoming increasingly more common in campsites, RVs, tiny homes and small apartments. If you’re curious about what's the best portable induction cooktop or you’re considering getting one yourself, this guide is for you! Basically, induction cooktops, portable or otherwise, generate a magnetic field directly above the cooking surface. When an induction safe piece of cookware comes into contact with this magnetic field, it generates an alternating current, which in turn produces heat. Because of this, the stovetop itself doesn’t generate heat. The heat is generated directly on the pot or pan, increasing efficiency and decreasing dangers. 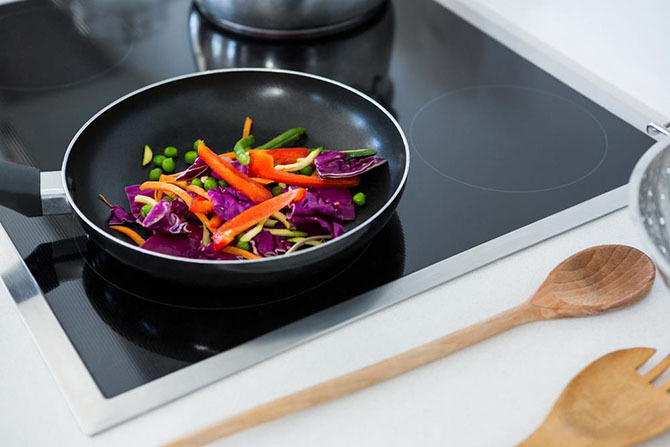 While there’s going to be a learning curve while you get used to your induction cooktop, particularly if it’s your first one, once you’ve mastered its use you’ll never want to go back to gas cooktops. Using induction cooktops is easy because they’re easy to clean and very responsive. The design allows you to clean simply by wiping with a wet cloth and since the surface doesn’t get as hot as with other cooktops, spilling liquids on it will rarely cook them, so you’ll be able to easily wipe them out. Induction cooktops are also quite responsive, reflecting temperature changes in a matter of seconds, which is a welcome ability for those of you interested in cooking finicky dishes. Because it works with magnets, induction cooktops tend to be quite lightweight and easy to transport, making them perfect to carry around or take to the campsite with you. That said, they’re not the sturdiest of cooktops, as they’re made with glass so while they’re quite portable, you may want to use something else if you’re planning to “roughing it up”. If you plan on being on an area with access to electricity then induction cooktops will soon become your best friends, as they consume relatively little energy and they get hot so quickly you won’t have to leave them on for long. This is largely a matter of personal preference but induction cooktops can earn you a lot of attention, whether you use them at home or you take them with you to the campsite. Their sleek and almost futuristic design guarantees that at least one person will approach you to ask you about it, making your portable cooktop an excellent conversation starter. Being the safest cooktops out there, as well as some of the most compact, portable induction stoves are perfect for small apartments or, better yet, college dorms. No fire hazard, no “accidentally leaving the electric burner on”, no cumbersome stove that takes up too much space. 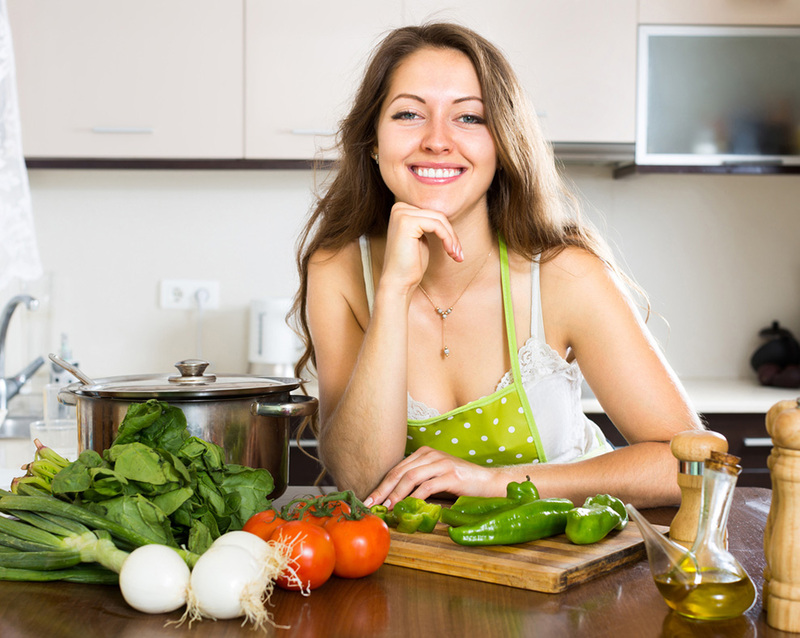 A small induction cooktop can be safely stored in a drawer until it’s time to use it, will stay cool until you put a piece of cookware on top and will help you cook all kinds of delicious things. Sometimes from the comfort of your own room. As you can imagine, portable induction cooktops come in a variety of sizes. Some of them come with a single “burner” while other may come with two. Even the single ones tend to vary in size, with some better suited for small pans and others for larger cookware. The size is very important because you need to maximize the cookware-to-stovetop contact to guarantee your stove works. Pans that are larger than the “burner” won’t heat up as easily so make sure your cookware fits. Precisely because they work with magnets, electric cooktops don’t work with all kinds of cookware, since not all materials are conductive. Because of this, you may have to purchase new pots and pans before you can use induction cooktops. - Most types of stainless steel pans such as the best Paella pan. Luckily, there are “induction disks” sold online that you can attach to the bottom of your cookware to make it induction compatible. Always keep in mind the power the portable stove uses and whether that matches your capabilities or not. This is twice as important if you’re planning on buying an induction stove for a camper or a tiny home. Now that you know how portable induction cooktops work and what you need to know before purchasing it, you’re ready to buy your own. 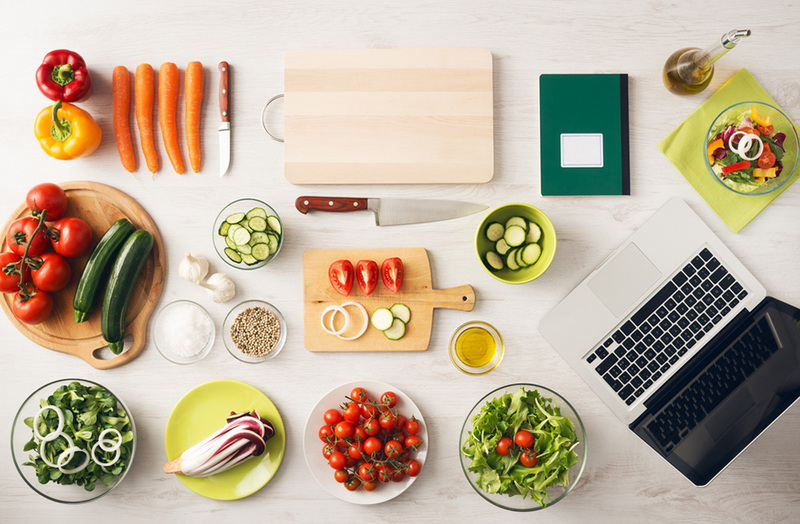 Don’t worry, we’ve researched and tested different brands and models in order to bring you the Top 5 Portable Induction Cooktops in the market today! A sleek looking induction cooktop that can adjust to small budgets, the Max Burton 6400 is an excellent choice for induction newbies who want to try the benefits of induction without breaking the bank. Powerful and versatile, with 15 different temperature levels and a reliable child lock function that guarantees the safety of your children, the Max Burton 6400 has definitely earned its place in this review. It comes with a touch panel that lets you easily choose the temperature (which goes from 140 to 450 degrees in a matter of seconds), the cooking time and even the power. This model weighs around 6 lbs and it measures 14 x 12 inches, making it easy to store just about anywhere. As far as the pan area goes, it works well with pans measuring anything from 4.5” to 6”. Temperature levels are very different from one another, which makes simmering things difficult. Available in two colors to better fit your personality, the Aroma AID is a beautiful and lightweight induction cooktop that’s easy to store just about anywhere, thanks to its small size. It comes with a touch control panel that lets you select time, power, time increments and to activate other functions. This portable induction stove can go from 140 to 460 degrees and comes with 10 different power levels that guarantee plenty of control when cooking. It has an automatic shut off of 60 seconds after the pan has been retired, which makes it perfect even for the most forgetful of individuals. The automatic shut off is far from the only safety function, as it also warns you when the voltage isn’t compatible and a second shut-off function that kicks in even if you never took off the pot from the stove. The Aroma AID gets really hot, really fast, which makes it perfect for people who are in a hurry, such as college students who may purchase this for their dorms. This fast heating comes with a downside, and that’s the fact that if you don’t watch the temperature changes carefully you may end up burning your food. A lightweight and efficient machine, the Aroma AID-509 features one of the most intuitive designs of the items in this list, thanks to its touch control panel which has a slight tilt so you can comfortably access it even when cooking. It comes with 6 different heat levels, which are neatly displayed in a bar, a function specifically designed to keep your food warm and a timer. This cooktop is made with ceramic glass, which offers it a bit more resistance than other models, but also means it doesn’t clean as easily as simple glass. In fact, it’s recommended to use toothpaste to do this. This model, which fits the standard US outlet, uses 1500 W of energy which can save you a lot of money in the long run, thanks to its efficiency, which is almost four times higher than gas stoves. Security wise, this unit comes with two functions that prevent it from accidentally turning on if the cookware isn’t placed completely on top of the heating element or if non-compatible metals are placed on top. This can mean non-induction friendly cookware, but also things such as cutlery or jewelry. It also shuts off automatically a minute after you lift the pot or pan. Weighing 12 pounds and measuring 24 inches in length, this is far from the smallest item in this list but it has twice as much to offer, thanks to the fact that it has two cooking surfaces instead of just one. Each one with guiding lines that help you place your cookware on top and separated controls to give you complete control. Though larger than other units in this list, this one can still be carried around and safely stored in cabinets to give you extra space. The ceramic glass cover cleans up easily and stays cool in the areas around the burners, minimizing the risk of injury. Power wise, this unit is very energy efficient. However, it does have a small problem and that’s the fact that, if you use both burners at the same time, you’ll only get half the total power for each. Safety wise, not only does this unit stays cook to the touch but it can also tell when there’s an induction friendly piece of cookware on top. This means the machine will be start running when it’s time to cook and shut off and start to cook when you take away the pan. This cooktop can go up to 450 degrees, and has a special function in place that makes sure it doesn’t go any higher. Another dual induction cooktop, this beautiful cooktop weighs roughly 15 lbs and is 26” long, which makes it lengthier than many of the items in this list yet perfectly portable and easy to store. Just like similar, two “burner” models, this one splits its power between the two when they’re in use. Unlike similar models, however, it goes up to 2000 watts so you’ll be able to cook more efficiently. As similar induction cooktops, this one has the ability to shut off when there’s no cookware on top and an automatic shut off function after certain amount of time. It also has a function that prevents it from overheating, which is super useful considering you can leave this on for up to 24 hours if you’re planning to slow-cook something. The fan can be quite loud and, like other induction units, there’s a faint buzz that bothers some people, but that’s one of the few drawbacks of this machine. 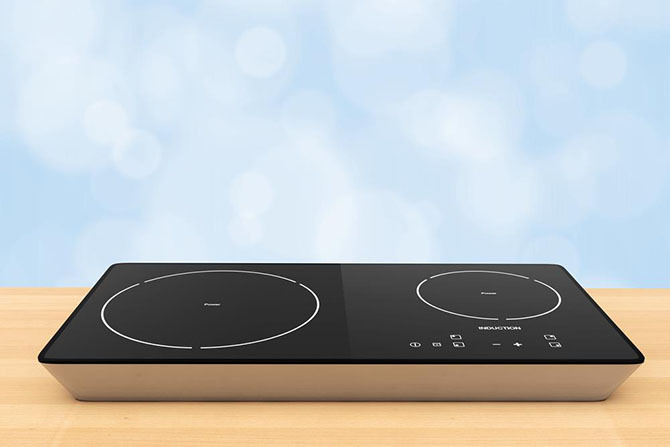 The Inducto Dual Cooktop also comes with various temperature levels, which can be adjusted on each burner. This function isn’t particularly intuitive, however, and often requires pressing a button several times to get to the level you want.